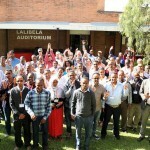 Leveraging private and public partners is key to increased productivity in the dairy sector, according to a poster by scientist from the International Livestock Research Institute (ILRI)-led project African Dairy Genetic Gains. 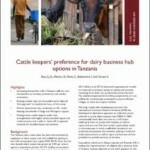 The scientists explore some challenges facing dairy farmers within developing countries, illustrating how these dairy production difficulties can be overcome through the establishment of more efficient artificial insemination services using genetically superior crossbred bulls and cows. 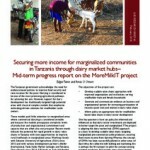 Ultimately, the poster illustrates the main goal of the ILRI-led project: to facilitate the lives of African smallholders and their families through livestock. Download the poster: Okeyo, A.M., Ojango, J., and Mrode, R. 2016. African Dairy Genetic Gains Program: Innovative private-public partnership for sustainable dairy productivity. Poster. Nairobi, Kenya: ILRI.